During the summer, there are sightseeing, angling and diving trips run from the pontoons (which has disabled access). Please contact the charter firm in advance to make a booking. 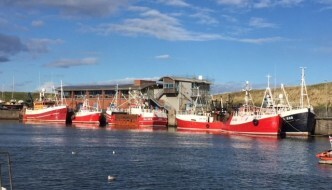 With the wealth of local marine life and crystal-clear waters, Eyemouth has become a world-famous venue for divers. We offer excellent access to the shoreline from the harbour. Aquamarine Charters can be chartered for diving and sea-angling trips. DiveStay run diving trips and provide accommodation at The Home Arms. Marine Quest run diving trips and provide hostel accommodation at The Harbourside. Scottish kayak fishing can arrange and advise on kayak fishing. Active4seasons offer sea kayaking and coasteering along the east Berwickshire coast.